Right-Comm2Line™ Duct removes the single line that represents the trunks and branches of your duct design in the Right-Draw® screen and replaces it with accurately sized two-line duct systems, resulting in CAD-quality commercial designs. View overview video. Right-Comm2Line™ Duct turns your simple duct design into a professional looking CAD quality file in just the click of a button. 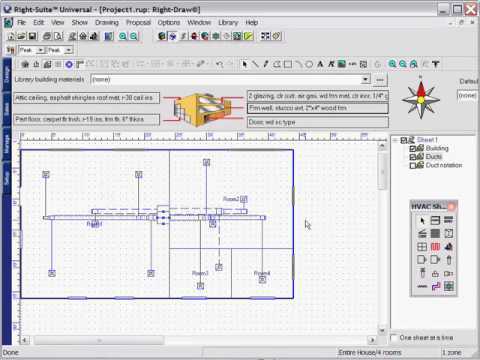 Write two-line plans back to a CAD file. Right-Comm2Line™ Duct offers the ability to write your duct design back to that CAD file as layers. Right-Comm2Line™ Duct separates you from the competition by making any drawing look professional with the click of a button. Builders can then seamlessly access these plans, creating a professional line of communication and a paperless office. Right-Comm2Line module removes the single line that represents the trunks and branches of your duct design in the Right-Draw® screen and replaces it with accurately sized and drawn two-line duct systems. Right-Draw®, Right-CommDuct™ and Right-CommLoad™ or Right-J®.